There’s nothing quite like a poorly blended backdrop to take a viewer out of the staged reality of a model railroad scene. But, you can avoid this issue and maintain a fluid scene by making the joint between landscape and backdrop as flush as possible. 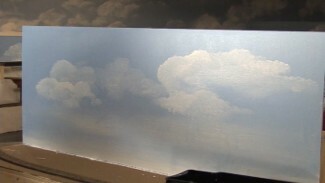 Good news is, painting model railroad backdrops that smoothly transition into the scene is a fairly simple process. All it takes is a good stiff paintbrush, colors similar to the objects you are blending, and an eye for detail. 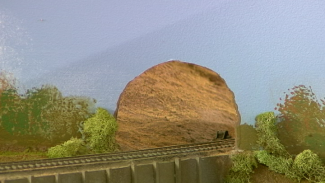 In today’s lesson on painting model railroad backdrops, we demonstrate the step-by-step process of blending rocks and trees that sit at the edge of your scene, including each of the simple techniques you’ll need to properly blend your backdrop. To help you create a smooth transition and teach you the methods you’ll need to blend the right way, expert modeler Tom Lund uses a sample scene to teach you his technique for painting model railroad backdrops, and particularly one that utilizes rocks and trees. You will learn how to match the colors found in your scene’s landscape and paint objects that don’t draw attention to themselves in a negative way. 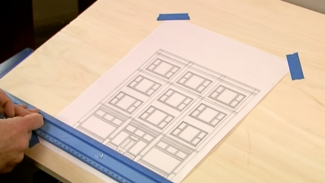 One of the concepts on which Tom focuses is the style of painting model railroad backdrops you’ll need to use in order to leave behind as few brushstrokes as possible. Similar to the way you would paint clouds or a treeline along a hillside, you’ll use the stippling method and a stiff brush to smooth the transition for both rock formations and trees. Tom also shows you how to intersperse painted undergrowth and shrubbery in a similar fashion to how you designed the scenery. This will help to better fill out the backdrop and make the scene more fluid. Thanks to Tom’s methods, painting model railroad backdrops is a whole lot easier and more appealing on the eye. See how they work on your next model!